Chandigarh : The Haryana government's dream project, Karnal's airport, is becoming only in the paper for the last ten years. The former Hooda government continued to carry this scheme only in papers and now in the last year of current government in state, Khattar government is planning to begin & the plan of Karnal airport is expanding only in the government files. Farmers giving land for the proposed airport have raised their demand for enforcing the state government's Direct Purchase Policy and on the lines of BJP-ruled states; they have demanded land acquisition and compensation. 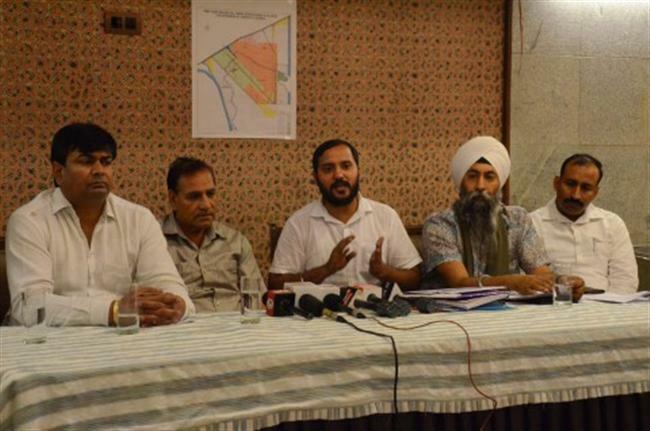 Explaining the situation, farmer Inderpreet Singh, Subhash Khokhar, Bhawanit Singh Kalyana, Kanwaldeep Singh, Balwan Singh and Manoj Kumar, resident of Kalvehdi, village of Karnal district, said that this project was initially spanning to only 18 acres, whereas in the year 2017 it has been Increased 28 acres and now the present government has expanded it to a large extent of 280 acres. It is clear that, the farmers/ land owners for the proposed project are being misguided by the former as well as by the present government. Explaining further, the farmers informed that the construction of airport project at Karnal was announced in 2008. Subsequent to this, in July 2013, on request of former Hooda government, the then central government agreed to the study report of Karnal Airport. Meanwhile, the construction of project was also announced during Lok Sabha elections and also announced by Prime Minister Narendra Modi during his first public meeting at Karnal after obtaining the power. Again on July 21, 2014, the Government of India announced the construction of the airport in Karnal under the flyovers plan for the change in government at the center. According to the farmers, their repeated inquiries are not being entertained by any of the departmental officials that on the basis of which they are constantly expanding the scope of land for project and on which scope basis lands will be compensated. Farmers expressed their apprehension that only the runway would be expanded by the government here, whereas the land thus being acquired under expanded scope would be used for some other work. - The land is acquired for the purpose and even if it is not complete, the land is not returned. - There is no provision of a job for the farming family who gives land. - The farmers cannot challenge the compensation amount fixed by the government. What is Section 26 of Land Acquisition? Farmers said that according to Section 26 of Land Acquisition, whenever a land acquisition is done for a project by the government, the caste rate is given to the farmers. Apart from this, the average rate of three years land rate of the villages is taken out and the compensation given to the neighbouring villages is made as the basis. Farmers' land is acquired on the basis of which all of these three are done, but none of these rules are being followed in the Karnal airport project. The affected farmers said that they are facing problems due to misguiding since the time of previous Hooda government.